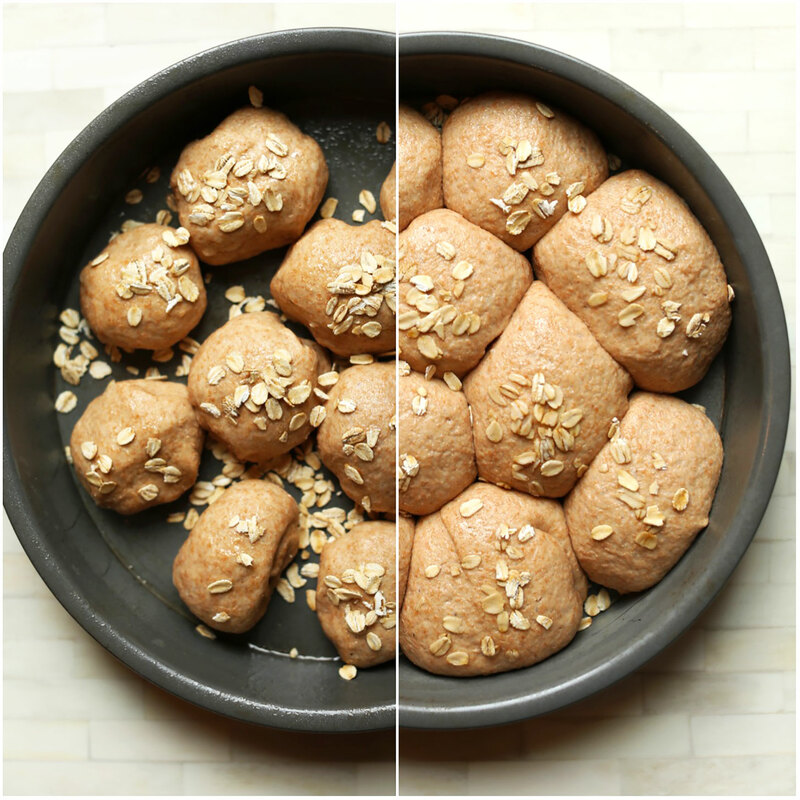 Allow me to present recipe #6 of Thanksgiving Week Extravaganza: Easy, Vegan 100% Spelt Dinner Rolls. Ready your vegan butter friends – we have bread to bake. I haven’t posted a recipe that’s not gluten free in a while because I’ve been trying to avoid gluten since January to see if it’s causing of any of my health concerns (which I also wrote about in this Cleanse review). The jury is still out. I feel fine on the few occasions I have eaten it – i.e. no stomach cramps – but I’m still on the fence about whether it really adds any benefit to my diet. So for now, I avoid it. With that being said, one exception I think I may make moving forward is whole grain, easy-to-digest flours like spelt or fermented sourdough bread on occasion. Besides, making fluffy, Thanksgiving-worthy rolls gluten free is virtually impossible in my experience. So today, I make exceptions and indulge. This recipe is simple, requiring just 7 ingredients and extremely simple methods! The dough is a mixture of almond milk, yeast, cane sugar, salt, olive oil and spelt flour. After resting, roll into balls and top with oats. Just a 1-hour rise before going into the oven where they bake up to golden perfection (see above)! 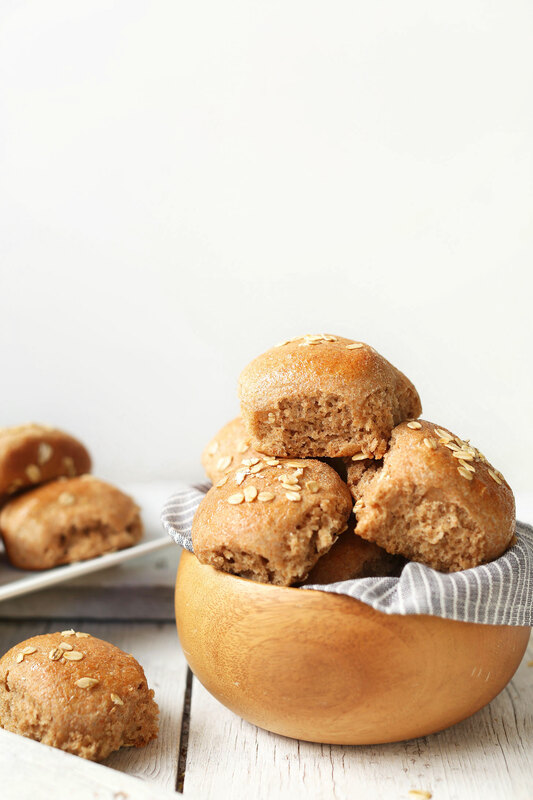 I hope you all LOVE these fluffy, tender, slightly nutty spelt rolls that are reminiscent of Cheesecake Factory’s Whole Grain Bread (which is kind of to die for). These are eerily close in texture and flavor. To a large mixing bowl, add 3/4 cup (90 g) spelt flour (amount as original recipe is written // adjust if altering batch size), yeast, sugar and salt. Whisk to combine. In a separate mixing bowl (or small saucepan over medium heat), microwave the almond milk, water, and olive oil until warm - about 110 - 120 degrees (~55 seconds). It should be the temperature of bath water. If it’s too hot, it can kill the yeast. Add wet to the dry ingredients and whisk vigorously or beat on medium/low for 2 minutes, scraping sides as needed. Add 1/4 cup (30 g) more spelt flour (amount as original recipe is written // adjust if altering batch size) and beat for another 2 minutes. Then add only enough remaining flour to make a soft dough (I used slightly less than the full 2 cups called for // amount as original recipe is written // adjust if altering batch size). Transfer to a lightly floured surface and knead until smooth and elastic (~1-2 minutes). Then place back in the mixing bowl, loosely cover, and let rest 10 minutes. Divide the dough into 10-11 equal pieces (amount as original recipe is written // adjust if altering batch size), carefully shape into balls (handling as little as possible), and place in a greased 8x8-inch baking dish or round cake pan. Cover and let rise in a warm place (such as on top of the oven or in a sunny spot) until doubled in size - about 45 minutes - 1 hour. Then sprinkle with oats. Preheat oven to 375 degrees F (190 C) . Once the rolls have doubled in size (see photo) bake for 18-20 minutes, or until fluffy and light golden brown. Carefully brush with olive oil for a shiny appearance (optional). Let cool a few minutes, then serve as is or with vegan butter and jam of choice. Store leftovers covered at room temperature up to 3 days. See notes for freezing tips. *I have not tested this recipe to be gluten-free and don't have any recommendations on how to make it gluten-free at this time. If you experiment and have success, please share your results/findings in the comments! *For darker rolls, you could also try subbing up to 1/2 of the spelt flour with toasted buckwheat flour. However, I have not tested it this way and cannot guarantee the results. *I only tested this recipe with organic cane sugar but I believe you could also try subbing coconut sugar, maple syrup, or raw honey if not vegan. If adding a wet sweetener, combine with wet ingredients before adding to dry ingredients for proper mixing. *To freeze, prepare the recipe up to the point of rolling into balls and then place the dough balls on a parchment-lined baking sheet. Freeze, and then store in a freezer safe container up to 1 month. When ready to make, place in a greased baking dish to thaw and let rise (loosely covered) until doubled in size on top of your preheated oven. Bake as instructed. Frozen rolls may mot rise as much as their fresh counterparts, but this is a good way to make bread ahead of time and bake it fresh as needed. I’ve never worked with spelt flour before. These were easy to make and delicious! Amazing! So quick and easy, healthy and delicious. I will definitely be making these regularly. 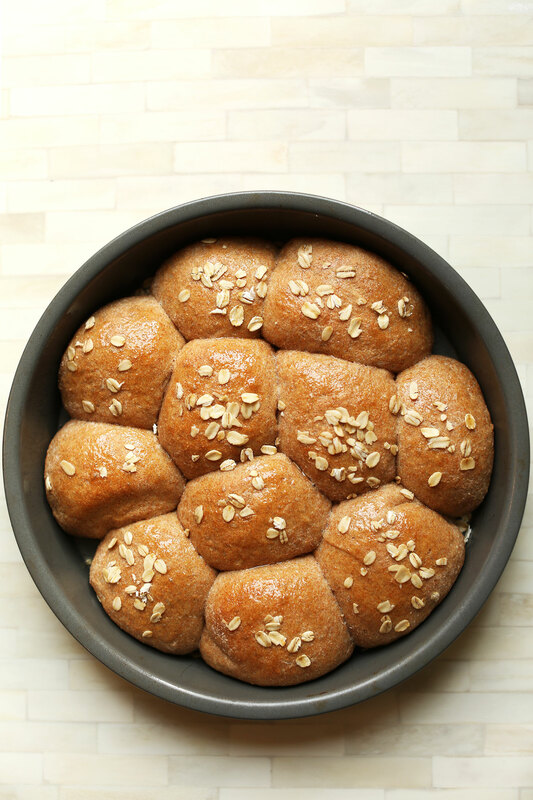 Having tremendous luck with Spelt Flour in all my “bread” recipes after 3 years of literally no bread, with the exception of gluten free recipes which frankly don’t float my bread boat…These are outstanding rolls, thank you. I did use local raw milk and thankfully here in Maine, we have a grower and Miller of the finest Spelt Flour I have tasted. Maine Grains- if anyone might be interested. Again, thanks for sharing this recipe…definitely floating my boat! These are yummy and teenager tested and approved! Can you substitute anything for the oil for those on oil-free diet? Brush with an egg wash right before baking. This will give it a darker, shiny appearance. For the dough, you can use butter and oil interchangably. Melt the butter, measure it out once it’s liquefied, then let it cool a bit. I made this for a Thanksgiving meal, substituting soy milk for the almond milk. It turned out just like your photos and they were a hit. I have now made this recipe twice, exactly how it’s written and the rolls have come out beautifully! Truly a great and easy recipe. The one batch was gone in a day. Thank you! This recipe is amazing!!! The only thing I did differently was I used 1 Tablespoon of honey instead of the sugar. My rolls were light and fluffy, just like pictured. Awesome recipe. Whoop! Glad to hear that, Michele! Thanks for the great recipe! Could the amount of sugar be reduced to make the rolls more savory? I was thinking of using them in pulled pork sandwiches. Thanks again! The dough come very sticky in the first phase and in when making the rolls before rise. any tips for to avoid this stickiness? Hi James! Adding more flour should combat the stickiness! I made it twice, first as a roll, second time as a loaf. The first mistake was I kept adding flour until the dough wasn’t sticky. I’m not sure how much flour I used, but it didn’t come out as soft and yummy as the loaf. My suggestion is to have a bowl with the 2C of Spelt off to the side so you don’t use more than that. OMG, I made these rolls this weekend and the rolls were everything you said they would be. They were fluffy, they were absolutely delicious. Once the rolls passed the taste test with my mom, it was smooth sailing. My husband liked them, my granddaughter liked them, true winner in our household. Yay! Glad they were a hit, Seles! Usually yeast dough in bread and rolls is proofed twice. Why are you proofing only once in this recipe? Hi Yaron! We didn’t find it necessary. But if you’d prefer, feel free to do a double proof! Made them tonight and they were amazing! Just used coconut sugar instead of cane sugar. Its what i had on hand. And they turned out perfect! My new go to roll! Just in time for Thanksgiving. Thank you so much! I made these last night and they are delicious! I may have over kneaded the dough a bit but they still worked. Hi there! I made this into a loaf of bread, instead of rolls, and it turned very good. I changed the oil to sunflower oil, because I didn’t want that EVOO taste. Thanks for the recipe. TIP: slice a piece of bread, toast it, spread some ghee on it, and slather some jam on it and YUMMY! Made these tonight for some vegan black lentil soup. They are delicious! Even our picky daughter ate two. The rest worked perfectly. This is a keeper. Love the short rising time too. I had to don’t the same, add more flour both times I’ve made this recipe. Maybe it’s the brand of flour I used. It was AMills Spelt flour. Most of my bread recipes call for about 2tsp dried rapid yeast for about 400g of flour. You seem to use twice as much yeast as all my other go-to recipes, I was just wondering why that is? I’m in the UK but I believe American yeast is supposed to be more active that ours. I’m confused! These are the best rolls, light and fluffy! I subbed 1 T. unsweetened applesauce for the oil and 1 T. honey for the sugar. I only used water for the liquid and pressed the oats into the top of the ball when shaping them. That way they didn’t fall off! I plan to use this recipe for the cooking class I’m leading at our church. Thanks Dana, love your recipes! AMAZING! I will never buy rolls again! I made these tonight; I think the first time I have ever made rolls before. Suffice it to say, they are all gone. Thank you! the texture is a perfect roll, with delicious flavor; not missing anything but some home made cranberry sauce to put on them. Making them again this week when my mom comes to visit. Love everything you make, Dana! I’ve been trying to make fluffy spelt bread. It’s coming out dense. What makes these rolls fluffy? I made this tonight with whole wheat pastry flour and turminado sugar instead of spelt and organic cane sugar. It came out really good that my grandmother, my 19 month son, and I inhaled them in at least 2 hours. This is a definite repeat in the future. So easy and so delicious! It’s a cold Saturday night and I had a sudden craving for warm bread and butter, these totally hit the spot! I made these using soy milk instead of almond milk and they turned out just fine! Great recipe! These were so easy to make and tasted great! They were also good for breakfast the next day. Are you using all-purpose spelt flour, or whole grain spelt flour in this recipe? They look delicious!!! I would love to make these! ! Whole grain spelt flour, I believe. But I think both would work. Easiest rolls to make, ever! And so delicious, ate one straight out of the oven :/ I was wondering, could these be made into a bread? How would the baking time vary? I would think so! Yes, maybe a little longer. Good luck! Hi! I am looking for an eggfree/dairyfree bun recipe for barbeque shredded chicken sandwiches for a party. Would these hold up okay? They sound delicious! I substituted 1/2 cup whole wheat sprouted flour for 1/2 cup of spelt. The recipe is great and while the rolls are light and fluffy, I think that they’re quite substantial as well. I made the mistake of baking longer than the suggested time as I was waiting for the rolls to brown a bit. Next time, I’ll back off and remove from oven a bit sooner. Definitely a repeat recipe for me. Many thanks for all of your phenomenal recipes, Dana! I used Bob’s Red Mill Spelt Flour along with cashew milk and they turned out to be wonderful. I also used a cast iron skillet to bake them and that made for a great talking point to state they were vegan to the family. Thanks for the recipe and all of your time you put into this site. I’ve been super into bread making lately and cannot wait to try these! These look gorgeous! I have never had much luck with baking vegan rolls, so I am very excited to try these. I’ve never worked with fresh yeast but am assuming it’s like active? You use the same amount if that’s the case! 2 1/4 tsp. Could I throw all this in my bread maker on the dough cycle, then firm the rolls and ride and bake? I love the ease of letting my bread machine do all the work, even if I don’t bake it in the machine. Any changes I’d need to make? Thanks! Ok, could have proofed that better! I meant form, rise and bake. Hi there! I’ve never used a bread maker but assuming that’s how it works, go for it! Dana, love your recipe. I double it & make it on dough setting of my bread maker(wet ingredients first, then dry, then make a well & add yeast last) I form into balls(even a loaf for cinnamon bread), let it rise, then bake. Delicious! 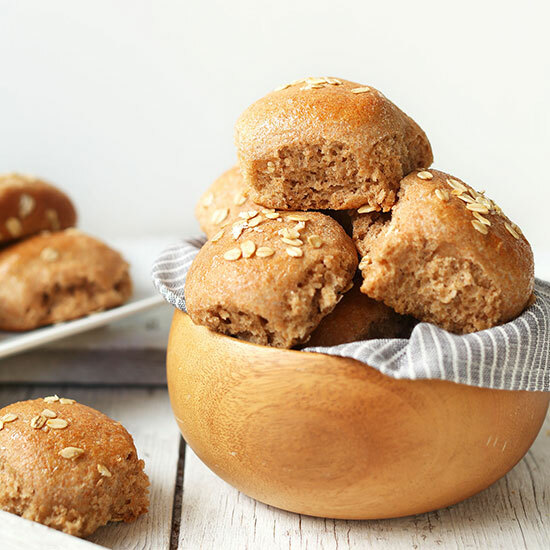 Best recipe for spelt rolls I’ve found!! Yum! Thanks for sharing your process, Christy! Made these yesterday with King Arthur AP flour. They were delicious and so easy to make especially with only one rise. The rolls were all gone in no time. I love your recipes Dana. You have made it so enjoyable to cook and eat vegan meals. Hi – I love this recipe however I’m unable to find “spelt flour” in my local market. Can I replace it with regular wheat flour and follow the recipe exactly? I had difficulty finding it in the local grocery store, but the Health stores carry spelt flour (and Amazon ;) ), if you’d still like to finding it. I’m so happy you are feeling stronger and trying to work your way through some difficult times. It’s not easy. I can definitely attest to that. On your podcast you mention ingredients that are in a lot of products…well, you should become the body care minimalist. (Not kidding). But, we all have limited time in our daily lives. I just want to thank you for all your recipes and the creativity behind them while being so very simple and yummy! I would also like to know a nut free substitute for almond milk. Thanks! Yummy…It look like soo delicious! I will try this soon. Thank you for sharing also waiting for a more awesome recipe that. I just made them but haven’t sampled them yet. I followed the recipe and directions but added the oatmeal at the start of letting the rolls rise. Using a pastry brush and brushing them with oil olive does make them more golden. The rising took an hour and I used dough enhancer along with regular yeast. Dough enhancer is a powder that includes ascorbic acid. The rolls look wonderful. Just got your email. Just want to let you know that no one should be eating gluten. It has been linked to all chronic illnesses, especially autoimmune diseases. You can learn about it at this series online free right now. I have no personal interest in this, only wishing good health to you. Can I use whole wheat all purpose flour? I didn’t test it that way, but yes I think that should work! Looks divine and healthy too! Can you please include the Nutrition Info. ? I am not seeing it on this post. Thanks! Good eye! Adding that now. Was just wondering if I can sub coconut milk for the almond milk? Nut free version. Hi there! I’d suggest rice flour first. I was planning on using coconut milk as well as im allergic to nuts now. sigh….it’s making going vegan pretty darn tough. My hubby is vegan and im basically vegetarian now but trying to cut dairy out as well for health reasons. Be on the lookout for the new canadian yellow pea milks! (We have one here called ripple we really like). They’re higher in protein than the nut milks and I believe are nut free. I am sure other brands will come out with rivals too! Hey hun! I don’t see the nutrition information listed at the bottom like normal. Sounds like you just forgot to put it in here though since you reference what it is based on. 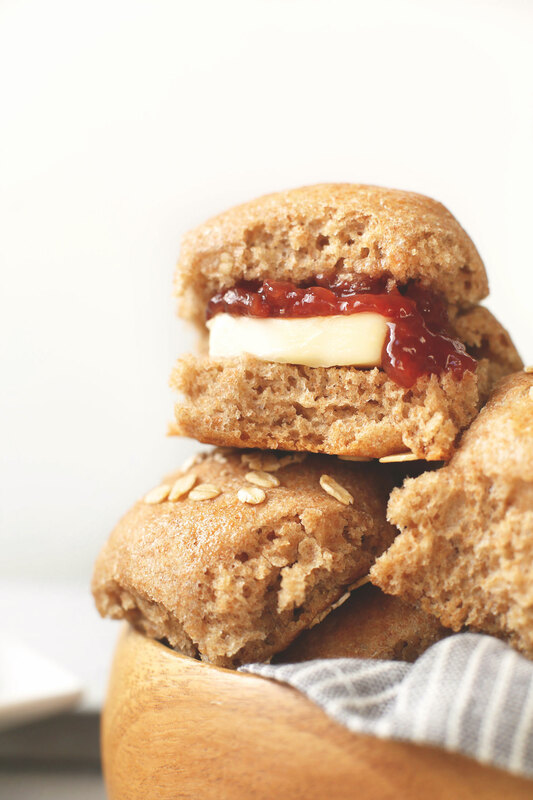 Is it possible to make these without yeast, baking powder or baking soda? What adjustment would I have to make? Hmmm I don’t think so. The photos look so good, I can almost smell the rolls from my screen! Looks delicious!!! I will be making for thanksgiving . I don’t see the nutrition facts included like you normally do? Can I make with whole wheat flour? I’m interested in subbing whole wheat flour, too! That’s would be easier for me too, but I was reading in my Bible the other day how all those old school guys in the old testament harvesting and baked with spelt!!! Way back then. So I am super eager to use it too. If it was good enough for them, then I’d love to try it in 2016!!! Spelt is definitely closer to what was used in biblical times. Our wheat these days has been modified so much it doesn’t even genetically match the wheat from even 100 yrs ago. One of the reasons that Celiac disease and gluten sensitivity has risen so much. Lots of info out there on it if you choose to research. You can use other flour such as Oat flour and what she used was Spelt flour. There is nothing in this recipe that I see that has wheat nor anything with gluten. The only change I can see is instead of using sugar use raw honey as the sweetener. Please tell me where there is Gluten in this recipe…..
Spelt is a type of wheat and does contain gluten. I didn’t test it that way, but yes I think it would work! Might I suggest whole wheat PASTRY flour?